Dr. Moira McPherson, President and Vice-Chancellor, and Dr. Andrew P. Dean, Vice-President, Research and Innovation, cut the ribbon at the grand opening of Lakehead's CASES building. Brian McKinnon, left, from Lakehead's Board of Governors, participated in the ceremony with Acting Mayor Iain Angus, Don Rusnak, MP for Thunder Bay – Rainy River, Judith Monteith-Farrell, MPP for Thunder Bay-Atikokan, graduate student Jocelyn Bel, and Dr. Pedram Fatehi, associate professor in Chemical Engineering and Canada Research Chair in Green Chemicals and Processes. 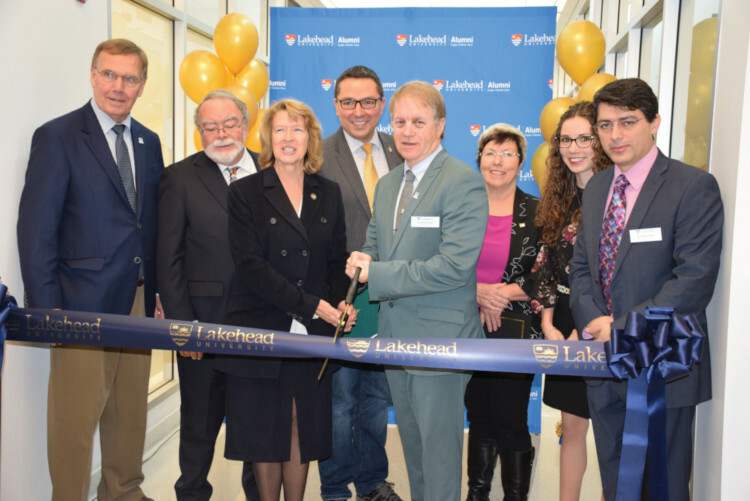 The grand opening of Lakehead University’s new Centre for Advanced Studies in Engineering and Sciences (CASES) on Friday, Nov. 30 was a prelude to the exciting moments that will occur in the new state-of the art facility for many years to come. The opening featured a ribbon cutting and tours of the attractive offices, labs, and state-of-the-art equipment. Everyone at Lakehead University is thankful to the federal government, the province, the City of Thunder Bay, and to donors for supporting the development and construction of CASES. The project will received $7.96 million from the Government of Canada, $1.54 million from the Province of Ontario, $5 million from the Northern Ontario Heritage Fund Corporation, $1 million from FedNor, $1 million from the City of Thunder Bay, $6.56 million in capital funding from Lakehead University and $855,783 in equipment funding also from Lakehead. “Modern learning spaces are key to helping students develop the skills they’ll need for the good jobs of today and tomorrow,” said the Honourable Navdeep Bains, Federal Minister of Innovation, Science and Economic Development, who was unable to attend the opening due to prior commitments. “Our government’s investment in Lakehead University is another step forward in our plan to boost innovation and grow the Canadian economy,” he said. Thunder Bay’s Liberal Members of Parliament also helped encourage the federal government to invest in CASES. “Congratulations to Lakehead University on the grand opening of the Centre for Advanced Studies in Engineering and Sciences,” said the Honourable Patty Hajdu, Member of Parliament for Thunder Bay-Superior North and Minister of Employment, Workforce Development and Labour. “The well-paying jobs of our future depend on supporting our innovators and industries. Our government invested $9 million in this important facility because we know that supporting innovation and research is critical to ensuring a strong and diverse economy for our region. I look forward to hearing about the great projects that will be developed,” she said. “Congratulations to everyone at Lakehead University on the opening of the CASES building,” said Don Rusnak, MP for Thunder Bay – Rainy River. “I have no doubt that this new and exciting project will bring great things to our region and further position Northwestern Ontario as a leader in the innovation economy. Investing in postsecondary infrastructure is essential to attracting and retaining a highly skilled workforce, encouraging entrepreneurship and boosting the local economy. I am looking forward to seeing the great things CASES will bring to Northwestern Ontario,” Rusnak added. “Ontario’s government for the people is proud to invest $5 million in the Centre for Advanced Studies in Engineering and Sciences,” said Ross Romano, Parliamentary Assistant to the Minister of Energy, Northern Development and Mines. “Our investment will support innovative research, create good jobs and encourage entrepreneurship in northern communities – sending a strong signal to the world that Ontario is open for business,” he added. Michael Gravelle, MPP for Thunder Bay – Superior North, played an important role in the provincial funding for CASES, along with Bill Mauro, former MPP for Thunder Bay – Atikokan and mayor-elect for Thunder Bay. “The new Centre for Advanced Studies in Engineering and Sciences at Lakehead University will provide more opportunities for our students to conduct ground-breaking research and innovation in Thunder Bay,” Gravelle said. “Projects like the CASES facility are essential for attracting top students and researchers, who bring new and innovative ideas that promote social, technological, and economic growth in our region. I am truly proud of this joint project that will profoundly benefit the students of Lakehead University, the people of Northern Ontario, and the scientific research community as a whole,” he added. The business incubator space known as INGENUITY will allow students and community members to work on creating their own start-ups in Northwestern Ontario, perhaps opening the next Apple, Netflix, Nike or Amazon. Acting Mayor Iain Angus attended the grand opening on behalf of the City of Thunder Bay. “Lakehead University is a key component of the economy of Thunder Bay and Northwestern Ontario, and the City of Thunder Bay is pleased to strategically invest $1 million in the Centre for Advanced Studies in Engineering and Sciences,” Angus said. “We fully expect that investment will grow the economy of our community and region and will be paid back multiple times over the next decade or more,” he said. “Congratulations to Lakehead University on the grand opening of the Centre for Advanced Studies in Engineering and Sciences,” said Judith Monteith-Farrell, MPP for Thunder Bay-Atikokan. “CASES will be a hub for research, innovation, and job creation for Thunder Bay and throughout Northwestern Ontario. I believe that CASES will be an important part of attracting and retaining a highly skilled workforce as we grow our region’s economy,” she added. “At Lakehead University we recognize the valuable role our students, researchers, faculty, staff and alumni play in strengthening our communities and advancing our economies,” said Brian McKinnon, member of Lakehead’s Board of Governors, who spoke on behalf of Board Chair Ross Murray, Q.C. “That’s the reason Lakehead’s Board of Governors approved this project when it was still under discussion,” he added. “CASES will allow Lakehead University researchers to have state of the art facilities to embark on research that will lead to exciting new discoveries and applications in science and engineering,” Dr. Dean said. “The strong support of the city, province and federal government to this project is very much appreciated and shows the commitment of each of these levels of government to investing in innovation, student training and entrepreneurship,” he added.